Remulakians Beldar and Prymatt get shot down on their mission to conquer Earth, and are forced to attempt to survive among humans until a rescue ship can come in 7 Zurls. This is long enough to have a child, Connie, and raise her to high school age. Prymatt worries about their marriage, Beldar is trying to handle Connie’s more human ways as she becomes a teen, and Connie isn’t sure how she feels about her boyfriend Ronnie, but the biggest threat to their security is INS Deputy Commissioner Gorman Seedling, who doesn’t care that they’re extraterrestrials so much as that they’re illegal aliens. I hadn’t realized the length of time that had elapsed between the SNL sketches and this movie. I should have realized that the 70s seasons Aykroyd and Curtin were in were far removed from the time SNL started doing movie spinoffs. This seems like an experiment to see if, after Wayne’s World, they could pull off an adaptation of a less-current, still popular sketch. On one level, it feels like they just opened up the sketch into its own fully-realized world. On the other, the plot this stands on, while hardly ever surprising, seems to come out of the concept so organically that it leaves the sketches looking like cheap imitations. The 14 years between final sketch and the movie also seems to explain a casting choice. While Connie wasn’t as much a part of the sketches as Beldar and Prymatt, I was puzzled by why they would recast her until I put it together with the time passed. Perhaps Laraine Newman aged out of the part. Perhaps it went in a different direction than she was comfortable with. Perhaps she was too busy for more than the cameo she got, one of quite a number of well-recognized SNL and non-SNL cameos. While much of the plot choices are, as I said, rather obvious (the villain is an obsessed government agent, the daughter is too assimilated to be okay with the plan to enslave humanity), one of the more surprising points is, when they reconnect with Remulak, how long they spend there. It seemed to wear on a bit long between getting there and getting to the end, going much further into the sci-fi side of the concept than really seemed necessary, until I realized it was setting up a character growth point. Still took a while to get there, though. It’s not high art, it’s not novel, it doesn’t exceed expectations. 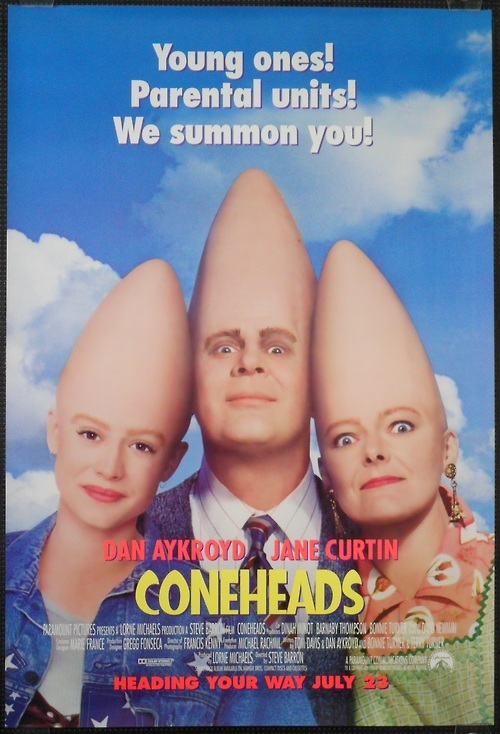 But Coneheads takes an idea from one medium and grows it into another in a way that’s a lot more believable and intuitive than many other adaptations of 5-minute sketches, with better cameo-spotting opportunities than some Muppet movies. Not bad for such a late arrival.